Citation: C N Trueman "Roman Engineering"
The Romans put a great deal of effort into engineering. Roman engineering led to the building of some remarkable engineering feats that have survived to this day throughout western Europe – be they roads, theatres, baths or Hadrian’s Wall. Engineering was used as a way of improving the lifestyle of the Romans even on day-to-day issues such as a frequent water supply. The Romans used the ideas of the Ancient Greeks to implement their own engineering plans. The whole issue of supplying Rome with water was solved using a system of 640 kilometres of aqueducts. The aqueduct at Segovia in Spain is 60 metres high in places. The fact that it has survived so long and in its current condition is testament to the engineering skills of the Romans. Another classic example of Rome’s engineering skill has the be the numerous Roman roads that still exist all over western Europe. 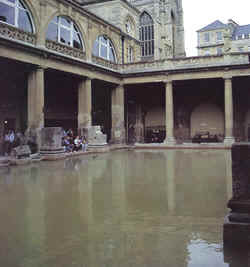 In England, the baths at Bath are not only indicative of the building skills that the Romans had but also their use of a natural resource for their own benefit. The Romans also built lighthouses, temples, palaces etc. many of which still exist today. Hadrian’s Wall is 117 kilometres long and in places is 6 metres high and 3 metres thick. Built in an inhospitable part of England where soldiers would have suffered from the wind and cold, the Wall contained toilets, washrooms and forts that could hold up to 1000 men. The fact that parts are now in a poor state of repair has nothing to do with poor building. Over the years, local farmers have helped themselves to the well cut stones that make up the Wall for their own farms and as a result it has suffered accordingly. The Romans used basic building tools that had been around for years to complete their building work. The movement of large building blocks was done by the use of levers and pulleys. These were powered by slaves – there was a plentiful supply of these in Rome.